What do you get when you combine Jack Black and a creepy old house? According to filmmakers, the answer is a formula for blockbuster potential. After playing R.L. Stine in 2015’s Goosebumps, Black is now the owner of another mysterious home in The House with a Clock in Its Walls, opening September 21. This movie has it all: witches, warlocks, ghosts, and even a horde of evil floating pumpkins. The tale centers on a young boy named Lewis, who moves in with his uncle, played by Black. If Lewis is searching for a normal life, he certainly won’t find it in this house full of magic. 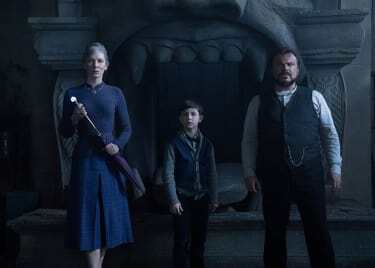 Here’s everything you need to know about The House with a Clock in Its Walls. The movie is based on the 1973 novel of the same name by John Bellairs, which is the first of twelve books featuring Lewis Barnavelt. The orphaned ten-year-old Lewis moves to New Zebedee, Michigan, to live with his uncle Jonathan. But Jonathan isn’t an ordinary guy. He’s a warlock who lives in a rickety old house that has a ticking heart. The menacing magical couple Isaac and Selena Izard previously owned the house. As part of Isaac’s plan to use magic to bring an end to the world, they constructed a clock that will tick eternally, and hid it in the walls. Fortunately for everyone but Isaac, he died before bringing his plan to fruition. When Lewis tries to impress a new friend, he accidentally releases Selena from her tomb. Her spirit sets out to complete the destructive plan that her husband never got to finish. Lewis, along with his uncle and their powerful witch neighbor Florence Zimmerman, must stop Selena and prevent Doomsday. 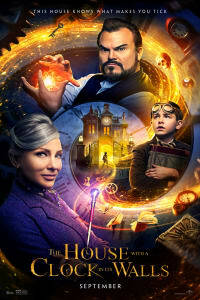 The House with a Clock in Its Walls features notable talents and a young actor primed for a breakout role. 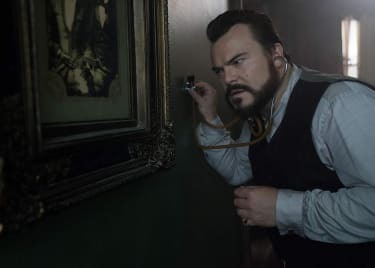 Jack Black is Jonathan Barnavelt, Lewis’s uncle who lives in the creaky house with a clock in the walls. He is described as a mediocre warlock with very good intentions. Jonathan takes in his young nephew after the boy is left orphaned. Cate Blanchett is Florence Zimmerman, a witch who lives next door to Jonathan and is one of his best friends. She is a powerful witch and becomes a key ally in the fight against Selena’s ghost. Owen Vaccaro is Lewis Barnavelt, who hopes for a normal life in New Zebedee. Considering the town is full of magic, that’s probably unlikely. Renée Elise Goldsberry is Selena Izard. Kyle MacLachlan is Isaac Izard, Selena’s evil sorcerer husband. Sunny Suljic is Tarby Corrigan, Lewis’s popular classmate. Lewis tries to impress Tarby by raising the dead on Halloween night. He added that there might be nods to his past films for fans to find, because the PG rating doesn’t mean the spooky fun will only be aimed at kids. If this film is as successful as the book series, a current generation of kids might get a chance to grow up with Lewis Barnavelt on the big screen. 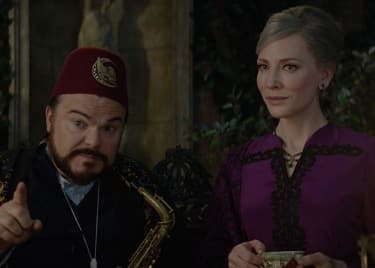 The House with a Clock in its Walls hits theaters September 21.